Shares why companies lose billions of dollars with outdated mainframe systems. Compares the strategies of upgrading, rewriting and rehosting and the benefits and drawbacks of each strategy. Presents three rehosting paths to support digital transformation goals: reducing MIPS, re-platforming legacy apps and replacing the mainframe. Highlights why companies are choosing the OpenFrame rehosting solution to foster innovation and increased ROI. 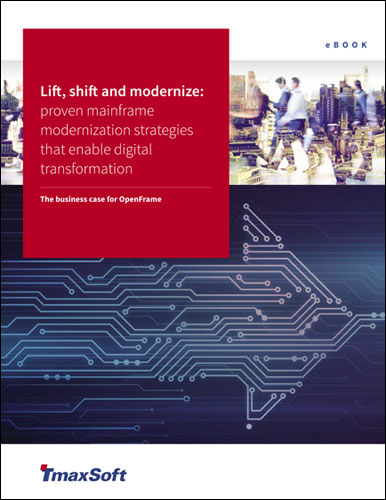 Describes how GE Capital reduced its mainframe maintenance costs by 66% with OpenFrame. Features industry examples for OpenFrame around typical project duration and TCO savings. Don’t delay, fill out the form to initiate your eBook download today. © 2019 TmaxSoft. All Rights Reserved.